Have you ever wondered what will happen to you when you are too old to bicycle on your own? There is an organization called Cycling Without Age that pushes for “the right to wind in your hair” for people of all ages. 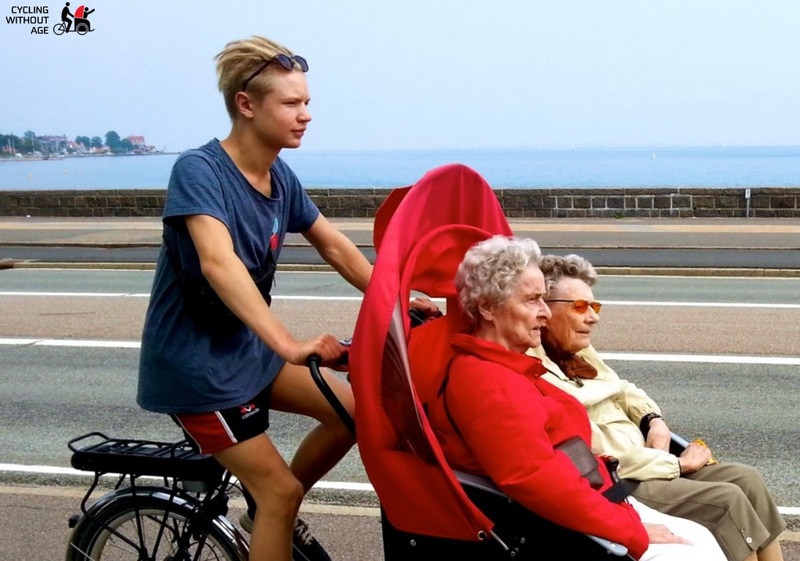 Cycling Without Age links volunteers with elders for trips on board “trishaws” – essentially a rear-steering tandem tricycle. This weekend, Angelenos can learn more about Cycling Without Age by enjoying a short documentary entitled “Finn.” The documentary screens at the All Sports L.A. Film Festival at 10 a.m. tomorrow – Saturday April 16 – at the L.A. Live Regal Cinemas at 1000 W. Olympic Boulevard in downtown Los Angeles. “Finn” tells the story of an 81-year-old man taking a Cycling Without Age bike tour from Denmark to Norway in 2015. Thanks to a crowdsourced appeal, Finn and his daughter Lis are coming to “Hollywood” for the screening. The short film is laying the groundwork for a longer documentary “The Grey Escape” which readers can find out more about via its Facebook page.